If you plan on celebrating St. Patrick's Day (Sun March 17) out on the town, you have a ton of options. To help ease your decision-making process, we've rounded up the biggest and best ways to experience the holiday, from the shamrock-themed EDM dance party Lucky to the boozy Ballard bus tour St. Pat's Parade O' Pints, and from the St. Patrick's Day Parade to Irish pub celebrations like Mulleady's. Find them all below, and check out our complete St. Patrick's Day calendar for even more options. Four-leaf clovers, also known as shamrocks, are said to bring good luck to those who pluck them. But according to Orlando de Lange, a Plant Molecular Biologist at UW, Americans have long mistaken the Oxalis triangularis, an entirely unrelated plant, for shamrocks. In fact, only a small handful have ever been cultivated on a large scale. In honor of St. Patrick's Day, learn about this sham shamrock and "the role of chance in selecting the plants that we eat and grow for pleasure." Do your most festive jigs to live sets from Stark Raving Plaid, Dread Pirate, the Irish Experience, That Irish Guy, and other artists eager to celebrate St. Patrick's Day. Trumpeters will lead a procession of green-clad Seattleites in the Irish and US National Anthems to kick off the 48th annual St. Patrick's Day Parade up Fourth Avenue, ending in Westlake Park. From there, participants are encouraged to hop on the Monorail (for free!) and head to Seattle Center's Irish Festival for closing ceremonies. King County Councilmember Joe McDermott will serve as this year's Grand Marshal. Try specialty beers and travel between Ballard's 11 breweries in the Hale's Ales double-decker bus. 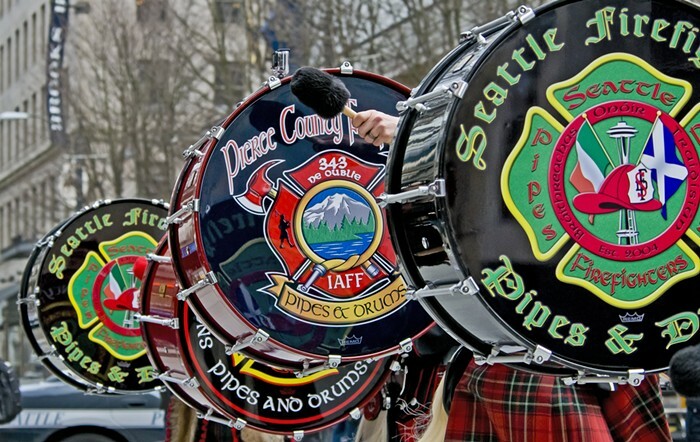 Your $5 bus fare supports the Seattle Firefighters Pipes and Drums. USC Events' annual spring festival, and the biggest shamrock-themed EDM party in Washington, will come to Tacoma for the eighth year of green and gold everything. Break out your glow sticks and prepare for "a Celtic-inspired land where whimsical creatures, boundless providence, and good fortune abode"—or, at least, heavy-hitter headliners like Galantis, Adventure Club, 3LAU, Ganja White Knight, Eptic, and Zeke Beats. This festival is chock-full of performances, live music ideal for practicing your Irish jigs, short film screenings, genealogy workshops, food, and more. It's part of the Irish Heritage Club's Irish Week, which also includes the Landing of St. Patrick, a genealogy seminar, and other events. Get your Saint Paddy's Day whiskey at the Seattle location of coast-to-coast Irish-themed chain Fadó, where they say they'll be "going all out, all day with the best St. Patrick’s Day party in Seattle." There will be brunch until the late morning and a screening of the annual international rugby union competition Six Nations with games by England, Scotland, France, Ireland, Italy, and Wales, as well as live music all afternoon and night. The Irish pub will serve a prix-fixe dinner menu with dishes like Beardsley fish cakes with red pepper aioli and traditional corned beef with rainbow chard and mashers, with a caramelized pear tart and a Cork float (Jameson, Guinness, nitro-brew coffee, and Jameson ice cream) for dessert. T.S. McHugh's will have a special St. Patrick's Day menu—including beef and Guinness pie, corned beef and cabbage, fish and chips, and Bailey's Irish cream pie for dessert—Harp Lager and Guinness on tap and a dozen Irish whiskeys at the bar. Plus, come for traditional and lively dance music from Claypipe (featuring harmonica, the Irish drum, accordion, and banjo), and stay for bluegrass from Creeping Time. There will be a cover for the bar, but not the dining rooms. The Paperboys will blend the Mexican folk style Son jarocho with Irish jigs and bluegrass for a truly genre-bending St. Patty's Day musical experience. Nosh on food from Wich Came First, Bread and Circuses, and Dante's Inferno Dogs while you groove to live music from the Evergreen Irish Dancers, the Jamisons, the Leger Family, and others at this all-night St. Patrick's Day event. For the 35th year, support community-run nonprofits by wearing green on green on green and running in the St. Patrick's Day Dash.